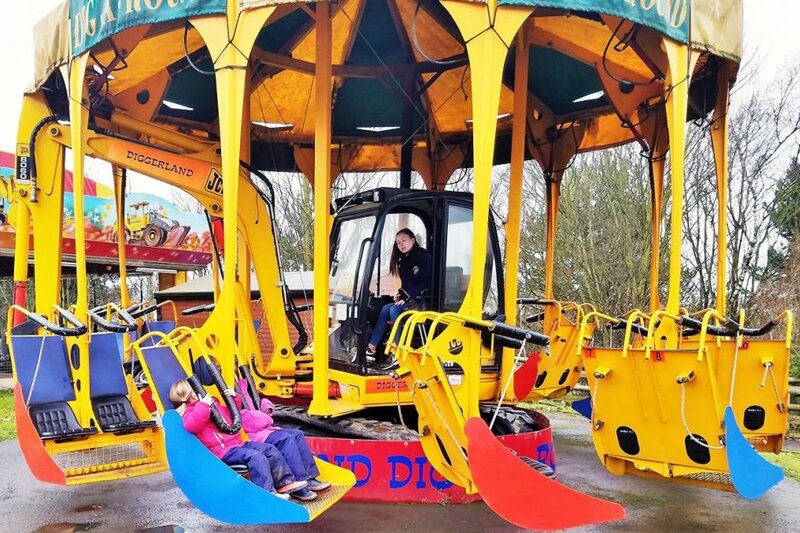 We invited Lucy (from the blog lucyathome.co.uk ) and her lovely family to enjoy a fantastic family day out at Diggerland Yorkshire in the rain. 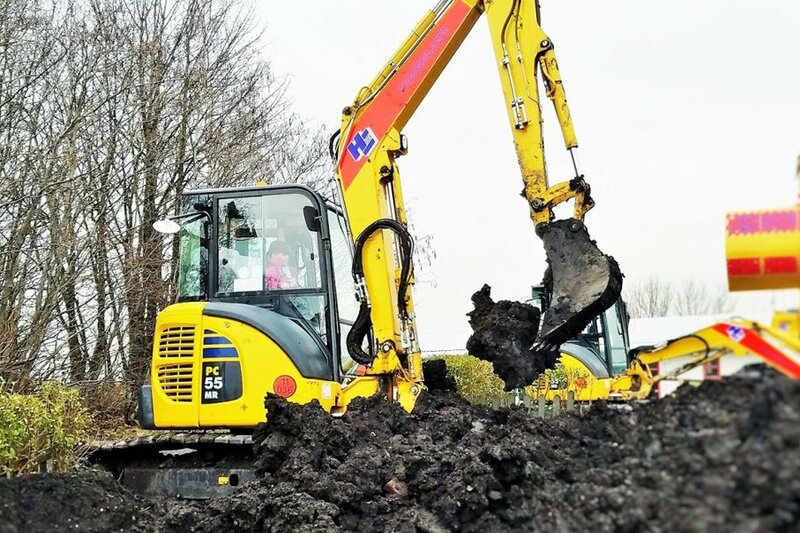 Read on to discover more about Emma’s day out:Last week was our very first visit to Diggerland and my girls are already asking when we can go again!I’m not sure what I was expecting – I guess a few diggers for them to climb on and maybe a trailer being pulled behind a JCB for us to ride on. But it is SO much more than that.The children aren’t being pulled along – they are doing the driving! There were lots of opportunities to operate digger arms – from knocking down skittles to hooking ducks, as well as shovelling great mounds of dirt around. There are levers everywhere and it takes some getting used to but they were determined to conquer the challenges. Shovelling mud was definitely hubby’s favourite bit and I did have to give him “the look” at one point as he got a bit engrossed and didn’t realise we were all waiting for him to finish! Haha. There are also go-karts, mini landrovers, tractors, diggers that have been turned into fairground rides, and a dinosaur safari experience! But one of my biggest worries about visiting in March was whether it’s any good going to Diggerland in the rain. I’ll be honest – it is an outdoors attraction so you will get wet if the weather turns. BUT because you are sat in real diggers, they all have roofs so the rain doesn’t affect your enjoyment of the activities. If you have waterproof trousers, these are useful as the seats do get wet, but it’s not a major disaster if you don’t. Our kids wore waterproof trousers but hubby and I went in jeans and we managed just fine. 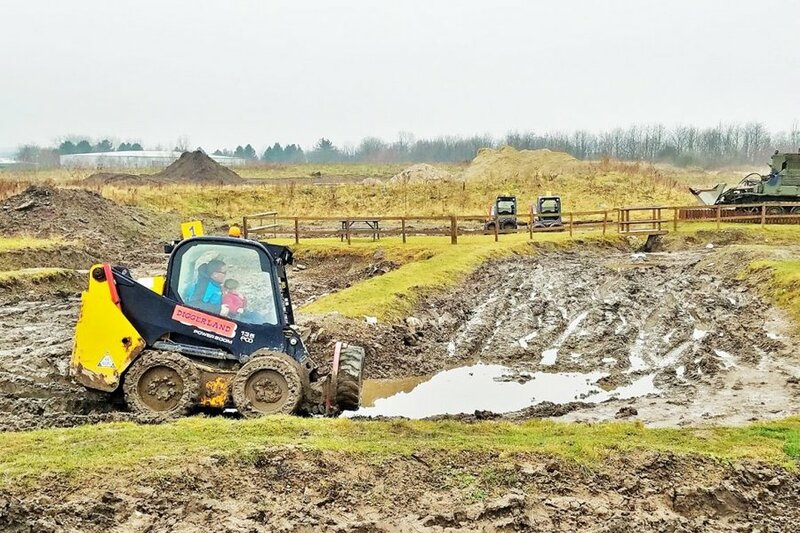 In many ways, we felt that going to Diggerland in the rain made it more fun – the mud was really slippery so we really putting the diggers through their paces. We skidded wheels, ploughed into muddy ditches, and splashed through deep pools of water. The other advantage of going to Diggerland in the rain is that there were NO QUEUES! I think the only thing we queued for all day was our food in the café! Haha. We just came off one ride and strolled straight onto the next. 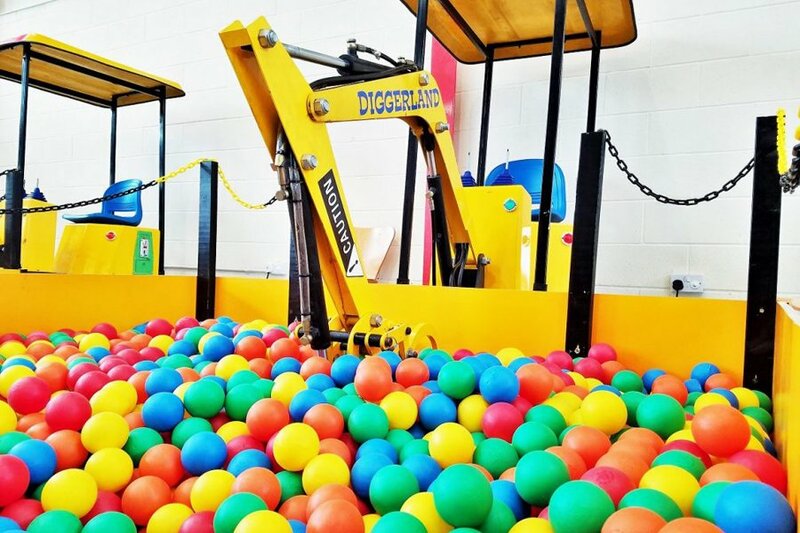 And if you do need a chance to dry out a bit, there is a large indoor soft play area complete with bouncy castle, tables and a separate toddler area. The cafe is very reasonably priced at just £4.95 for a cooked children’s meal and drink and I would describe it as “good café-style food”. As a mum, my top priority is knowing where the toilets are! Diggerland Yorkshire is very tightly packed together and so, although all the toilets are at the entrance, you’re never more than 200 metres away. It costs £16.99pp for adults and children over 90cm. That has always seemed quite expensive to us but, having been, I think its well worth it. We arrived at 10:15am and left at 4:15pm – that’s 6 hours of fun (working out at just £2.83 per hour). The children (and adults) were thoroughly entertained and we only went home because we were worn out from such a busy day! My girls are not super fanatical digger people, but they absolutely loved it! If you have a child who is digger-mad, they might just explode with happiness! Hahaha. I cannot praise the staff enough– they were all super friendly. They cheered our girls on as they tried to complete the challenges and they always asked parents’ permission before helping children on and off the equipment. 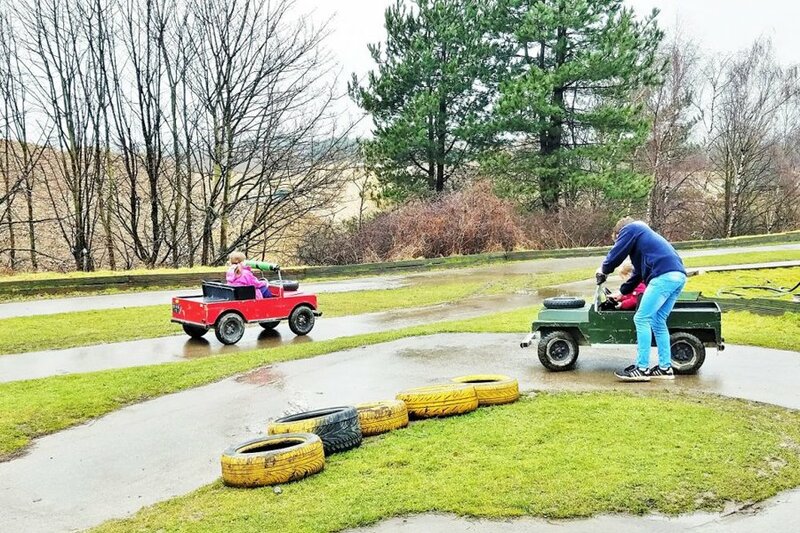 When Charis (3) decided she wanted to drive a mini landrover by herself, one of the staff members jogged next to her round the whole course to keep her on track. He could’ve tried to steer it for her or insisted on us running round next to her, but he didn’t – he let her try herself and only stepped in when she needed him. My girls are 7 and 3 and I think they were the perfect age! Once your child is 90cm, they can go on most things, and by the time they’re 100cm, they can do almost everything. As they get taller still, they will be able to operate more of the machines by themselves instead of taking an adult along. The fairground-type rides worked up to speed slowly so that any children who decided it was too scary or fast could get off. The Spindizzy ride (which I found terrifying, btw!) has a system in place whereby if someone does a thumbs down sign at the operator, they immediately stop the ride. Some of the diggers have extra levers for little ones to play with so that they feel like they’re driving (even though it’s actually their adult doing it). We had a fab day out at Diggerland in the rain! It definitely gets a thumbs up from this Yorkshire family and we can’t wait to go back again! 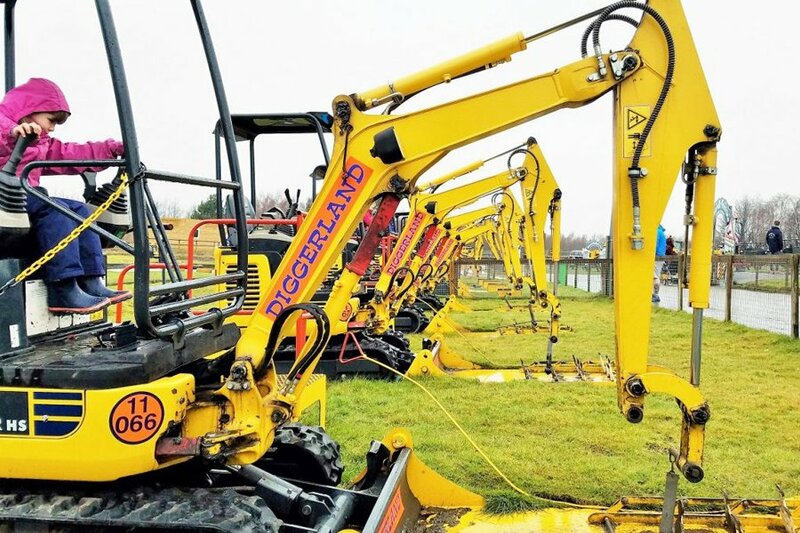 Have you ever been to Diggerland in the rain? What is your favourite thing about a trip to Diggerland? Do you have any digger super-fans in your family? Let me know in the comments section below.